Stanisław Skalski was born on 27 November 1915 in Kodyma, Ukraine. In autumn 1935 he began a unitary course at the Infantry Reserve Officer Cadet School in Zambrów and in January 1936 he began his training in the Air Force Cadet School in Dęblin. On 15 October 1938 he was promoted to lieutenant pilot and assigned to 142nd Fighter Escadrille in 4th Flight Regiment in Torun. On 1 September 1939 he participated in shooting down the reconnaissance aircraft Hs 126. The shot-down German aircraft turned over and landed on a plowed field. Skalski landed nearby and took the crew captive. He bandaged the wounded soldiers and handed them over to the ambulance. On 17 September 1939 he was evacuated to Romania and crossed the border in Śniatyń. He avoided being taken into internment in Romania and boarded a Greek ship which sailed to Beirut, then to Marseilles. He arrived on 29 October 1939 in France. Initially he got to the barracks in Salon, but then he was transported to Lyon. On 27 January 1940 he sailed to Great Britain. He stayed in the camp for Polish pilots in Eastchurch, then he was assigned to the military 6 Operational Training Unit in Sutton Bridge. After the fighter training he was assigned to No. 302 (City of Poznan) Polish Fighter Squadron RAF but he was quickly sent to Blackpool. He waited for the combat assignment for a couple of days and finally on 30 August 1940 he was assigned to No. 501 Fighter Squadron RAF at Kenley Airfield. Skalski in a cockpit of Hurricane, Kenley 1940. Skalski archive. Over Canterbury, when he was attacking a Messerschmitt, he was hit by the fire series of another Bf 109 and his plane burst into flames. Skalski, wounded in the right thigh with a bullet and burning, escaped from the airplane. During evacuation he collided with the airplane’s stabiliser and lost consciousness for a while, and woke up only when falling on a parachute, which he opened subconsciously after the flames subsided. He landed in a beetroot field and he immediately received first aid from a Canadian doctor in a military camp. After recovery he returned to the No. 501 Fighter Squadron RAF where he continued his flights. RAF Squadron 501 was stationed at Kenley Airfield between 10 September until 17 December 1940. 501 Squadron photo, Kenley 1940. 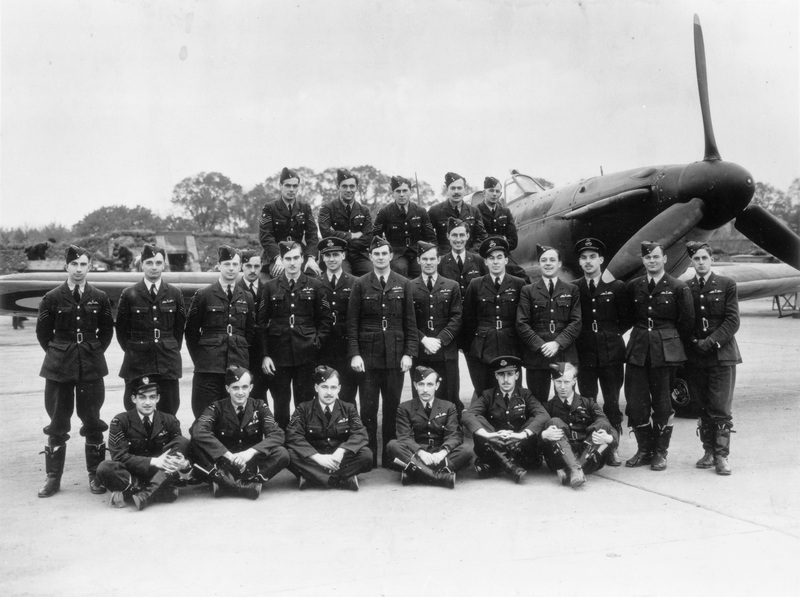 Copyright of Surrey History Centre, Pilots of 501 RAF Squadron in front of a Hurricane – lieutenant Stefan Witorzeńć (second from the left, standing), second-lieutenant Stanisław Skalski (first from the right sitting). On 1 March 1941 Skalski was re-assigned to No. 306 (City of Torun) Polish Fighter Squadron, where initially he served as an officer in the ground operations room, later as a regular pilot. Exactly after a year of serving at No. 306 (City of Torun) Polish Fighter Squadron, on 1 March 1942, Skalski moved to No. 316 “City of Warsaw” Polish Fighter Squadron, where he took command of the squadron “B”. On 30 April 1942 he was appointed to succeed the killed commander of No. 317 “Wilno” Polish Fighter Squadron, captain Peter Ozyry. He commanded the Squadron till 8 November 1942, and then he was transferred to 58 Operational Training Unit in Grangemouth as an instructor. Skalski wasn’t teaching young pilots for long, because in January 1943 he submitted his candidature to organize the Polish unit, which was to be sent to North Africa. His application was accepted and in mid-February he checked in at RAF West Kirby’s station in order to gather tropical equipment, get injections, etc. After disbanding the Polish Fighting Team on 22 July 1943 the British RAF offered Polish pilots two command positions in fighter units in the Mediterranean area. Skalski, lieutenant Władysław Drecki and lieutenant Eugeniusz Horbaczewski took that offer. Skalski ended up in No. 601 Fighter Squadron RAF, taking up the command (it was one in three cases of Polish command over an English squadron). Initially flying from Luqa Airport in Malta and then from Sicily, Skalski took part in the invasion of Italy. On 12 December 1943 he took command of the No. 131 Wing (at the time the squadrons No. 302, 308 and 317). On 6 April 1944 he was transferred to the commander of the 133 Wing, which consisted of Polish squadrons No. 306, 315, and 129 Fighter Squadron RAF. On 2 August 1944 he passed the command of the wing to major John Zumbach, and he went to a training course for officers at the US Army Command and General Staff Office at Fort Leavenworth in the United States. After returning to England Skalski was an operation officer in the No. 11 Fighter Group RAF from February 1945. From 1 February 1946 he was in command of the British Air Forces of Occupation in Germany. In December 1946 he joined the Polish Resettlement Corps, and in June 1947 he returned to Poland. Stanisław Skalski ended his service in the Polish Air Force at the Polish rank of a major and British rank of Squadron Leader (previously had temporarily rank of Acting Wing Commander). He was awarded with the Golden Cross War Order Virtuti Militari (No. 32), the Silver Cross War Order Virtuti Militari (No. 8996), four times with the Cross of Valour, Order of the Third Class Cross of Grunwald (after returning to Poland, by the communist authorities), the Field Pilot Badge (No 402), Wound Decoration and British Distinguished Service Order and three times with Distinguished Flying Cross (as the only Polish man). 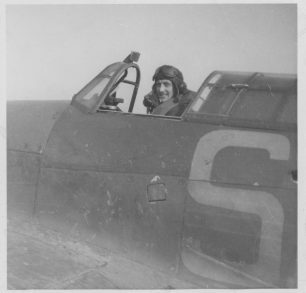 According to the official results of the Bajan’s list he shot down 18 planes on his own, and three airplanes together with other pilots, which makes him the most successful Polish fighter pilot. After War, between 25 March and 30 March 1990 he was in Germany, where he met Fritz Wimmer (a pilot of Henschel, whom he helped in 1939) and the twin brother of the second crew member (Siegfried von Heynemann died in 1988), Joachim. Germans thanked Skalski profoundly for the help given and most probably for saving their lives, and then they shared their own war stories. Skalski died in military hospital in Warsaw on 12 November 2004 at the age of 88. He was buried at the Powazki Military Cemetery.